After five decades of complete seclusion, Burma (also known as Myanmar) is new to the world’s stage as a tourist destination. A culturally rich country, there is much still unexplored by the average tourist, making this Burma tour ideally designed to excite the adventurous. The unspoiled hill tribe villages, peaceful colonial towns, and bustling cities do share one thing in common though; they’re home to a nation of friendly, welcoming people. With plenty of flat picturesque landscapes mixed among the low hills and one or two tough slopes we’ll ride, the route is a nice mix for both experienced and novice cyclists. Journey off-road amid peaceful pine trees and stunning countryside. And challenge yourself to the gentle 10-km gradient up to limestone caves of Pindaya to view over 9,000 Buddhas. Yet, the Burma adventure is so much more than just cycling, it’s an opportunity to visit the many splendid sights the country has to offer. Take in Asia’s longest teak bridge, the famous U Bein bridge, and hear the clear ring of the world’s largest bell at Mingun Pahtodawgyi. Admire the talented Intha fishermen, who famously row their boats with one leg, and enjoy Burmese hospitality as we cruise the Irrawaddy River. All this and so much more. We meet at our hotel for a welcome dinner. Take a short flight to Heho and transfer to Kalaw. Enjoy this cool and peaceful town amidst pine trees as we ride the countryside. Today’s journey may be long, but it’s a fabulous ride down off the plateau to the shores of tranquil Inle Lake. Discover Inle Lake onshore on our ride through villages and temples. A boat will let us cruise to Indein temples, floating gardens and Intha fishermen. Back on land and up to Shan Plateau, we cycle dirt and paved roads to Pindaya, home to limestone caves that house thousands of Buddha images. Discover the countryside on our way to Mandalay riding undulating trails through patchwork of fields. Head out of the city to U Bein, the longest teak bridge in Asia, on our way to visit towns across from Irrawaddy River. Explore Mandalay by bike starting off at the sprawling Zegyo market on our way to Shwenandaw Monastery. The rest of the day is free for exploration. We explore the ancient Ava Kingdom and continue through fields of millet, sesame and cotton to the town of Pyinsi and transfer to Mt. Popa. No bikes today. We climb 900 steps to the top of Popa Taung Kalat, a temple most populated by revered nats (spirits). The afternoon is yours to relax at the pool or hike the national park trails. On an easy descent from our lofty heights, we ride through small villages and palm gardens to the temple city of Bagan. On our bikes is the best way to discover Bagan. We cycle around the Archaeological Zone, visiting variety of temples. Catch the setting sun over the river or enjoy the sunset atop a temple. 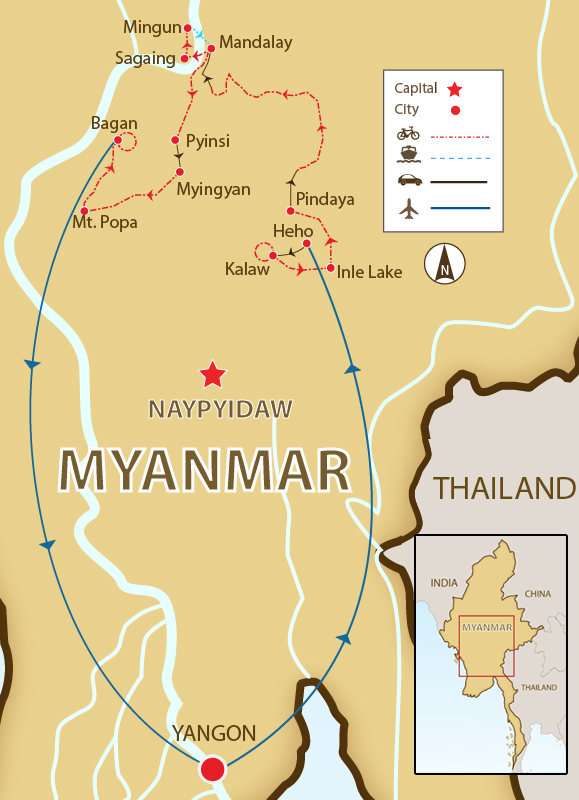 We fly back to Yangon in the morning, viewing from the air some of the terrain we’ve covered by bike. The morning is free for shopping at Bogyoke Aung San Market before heading to the airport. Day 2 - Yangon - Heho - Kalaw Ride 28km. +463m / -469m. Probably one of the best ways to learn about and experience an unfamiliar country and culture. Our guide, Thein, was superb. He was incredibly knowledgeable about Myanmar and very attentive to all of us on the trip, to make sure it was a good experience for the fastest and the slowest rider. Thein was an extraordinary guide. I rated him as excellent in all aspects. In terms of the activities, a visit to a family paper making shop and the dinner with the family thereafter was a highlight, as well as some of the stops at small family businesses, like sugarcane processing. The guide and driver were exceptional. They made every effort to make our holiday enjoyable, spent a lot of time showing and explaining Myanmar culture and history and made the holiday very special. This is a touring trip using mountain bikes, and we cycle 519 km on country lanes and quiet roads. Though 80% of our riding will be on tarmac, the road can be in poor condition in spots. We take some dirt roads, but these are not technical; they are just to take you off the beaten track. The first few days of riding are up and down the Shan plateau, but the gradient is very gentle. We will pass through many villages, and you will find the people curious, friendly, and polite. We share the road with ox carts, cyclists, and waving children. The second phase of the tour are flat rides or on gentle rolling hills and cut through rice fields, ancient cities, and scenic countryside. The averagely fit cyclist will have no problems. The trip is fully supported; an air-conditioned bus follows us for the entire journey, so exhausted riders can skip the tougher sections if they wish. On major roads, riders can find their own pace and meet up at prearranged points along the way. There is an unbelievable amount to see throughout the tour, and we stop frequently to view temples, rural scenes (especially if riding during rice harvest), and villages. Suitability: This trip is a touring bike journey suitable for anyone with a reasonable level of fitness. There are some long rides, and one or two tough climbs; participants who cycle the whole distance should expect a fairly challenging two weeks. But with the excellent support, inexperienced riders, and even non-riding partners, can be catered for and are more than welcome to join this tour. Biking Conditions: Although this tour covers around 498 km in 7 full cycling days and 3 half days, it is still quite demanding. This trip has a variety of roads, some in quite good condition to broken tarmac roads, to vehicle-wide dirt trails. There is no technical riding on this trip, but there are some long days. We will meet at the hotel at 7 pm for a welcome dinner at a local restaurant to give us the first tastes of Burma. We have an early morning flight to Heho and then a short transfer to our hotel in the former hill station of Kalaw. This cool, peaceful town amidst pine trees still retains its colonial feel. After lunch, we prepare for an afternoon ride through the countryside of Kalaw. This off-road ride will be a perfect introduction to your bike and give you a chance to warm up your cycling legs. There will be some up-hills, but we will be cycling through some stunning countryside, making the effort worthwhile. 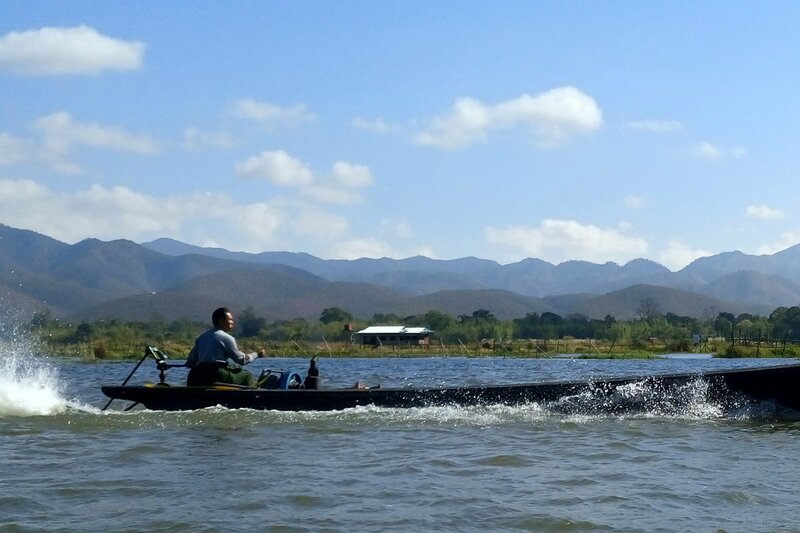 We have a fabulous ride down off the plateau to the famous Inle Lake. Though we cover many kilometres, the last section has two sweeping downhills, which take us directly to the shores of Inle. We will be on both paved and dirt roads, taking us through the Burmese countryside. After lunch we will stop at Indein village to visit some of the hundreds of pagodas that date back to the 14th century, though most are from 17th and 18th century. We continue our cycle alongside one of Asia’s most beautiful inland waters to Nyaung Shwe, located north of the lake. We spend the day exploring Inle Lake, from the shore and on the lake. In the morning, we start with a 30-km ride along the shores, riding through villages and past temples.After a lakeside lunch we'll board a boat and cruise to Phaung Daw Oo Pagoda, floating gardens, monasteries and the Intha fishermen, who famously manage to row their boats with one leg. In the evening we'll have a treat and visit a vineyard for sunset. Dinner at local restaurant in Nyaung Shwe. We leave lovely Inle and head back up to the Shan Plateau. Shan State covers almost a quarter of Myanmar and is home to several different ethnic groups. Again, we will be cycling on both dirt and paved roads, and though we will be mostly climbing, there will be some downhills. There is one major 10 km-long climb today, but the gradient is gentle. Our destination is Pindaya, home to limestone caves that house thousands of Buddha images. We'll visit the caves before dinner. Starting on the bicycle from the hotel will bring us to Burma's second city, Mandalay. Initially, the ride will be undulating through a patchwork of fields before we start a long descent. We'll be passing many villages on the way where you'll be greeted by “hellos” from the children. When we reach Ywa Ngan, we stop for lunch and then load up the bikes into the support vehicles for a short transfer to Mandalay. We head out of Mandalay to explore the towns of Sagaing and Mingun on the opposite side of the Irrawaddy River. We cycle first to the famous U Bien Bridge, the longest teak bridge in Asia, where we'll have some excellent photo opportunities. We then ride along the river past Sagaing, an important religious and monastic centre and, subsequently, home to numerous monasteries and stupas. We continue on our photogenic cycle route to Mingun to visit the ruins of Pahtodawgyi. This massive, unfinished stupa would have been the largest in the world if completed and now might be the largest pile of bricks in the world, but is nonetheless impressive. We'll also see the Mingun Bell, which weighs 90 tons and is the largest ringing bell in the world. After a lunch of local specialties, we'll have an easy return via boat. Relax and watch life go by as the river takes us downstream to Mandalay. This morning, we explore Mandalay by bike, starting with a cycle to sprawling Zegyo Market, crammed with stalls and shops selling everything from food to clothing to jewelry. We have some time to explore this labyrinth before we jump back on the bikes and continue our riding. We stop when we see artisans weaving bamboo into large sheets to be used as roofs and walls or a crispy tofu maker. A visit to Shwenandaw Monastery, aptly named “Golden Palace,” is a must-see. This wonderfully fragile, yet grand example of 19th century Burmese teak architecture, is heavily gilded with gold and adorned with glass mosaic work and impressive carvings of Buddhist myths. We head back to Mandalay a different way, stopping for tea and to taste some local snacks. The afternoon and evening are free to give you the chance to explore Mandalay on your own. We start early with a short transfer to Tada U and ride into the capital of the ancient Ava Kingdom. Here we'll see remnants of a city wall that protected the city that ruled upper Burma for nearly two centuries, from 1364 to 1555. We continue our ride through fields of millet, sesame, cotton, and many varieties of peas and beans to the town of Pyinsi. Here we pack up the bikes and transfer two hours to Mt. Popa. Our first complete day off the bikes, but that doesn't mean we won't still be active! After breakfast, we climb the almost 900 steps to the top of Popa Taung Kalat, a temple that is populated by Burma’s most revered nats (spirits). As you walk up, you will pass dozens of nat shrines and see pilgrims who come to honour them. From the top, you will have a panorama of the surrounding plains. The views are excellent, and photographers will get some great shots. The rest of the day, you are free to relax by the hotel's infinity pool overlooking the temple, or for those more adventurous, there are hiking trails in the national park. We meet up for dinner. Wake up to superb views! After breakfast, start with an easy descent from our lofty heights. We snake down around the mountain, as we ride through small villages and palm gardens, coming across farmers ploughing their fields with wooden ploughs and water buffaloes. We ride into Bagan, littered with thousands of temples along the banks of the Irrawaddy River. Our riverside hotel offers a refreshing pool to cool down in. In the morning, we transfer to the airport and fly back to Yangon, viewing from the air some of the terrain we covered by bike. We arrive in time to take a trishaw ride in downtown Yangon and see the Shwedagon Paya, Burma’s holiest religious site at dusk. In the evening, we meet up for a farewell dinner. Because some people can't imagine going on a trip without their own beloved bicycle, we do not provide them as part of this tour. However, you can hire bikes locally for the price listed in the tour pricing section. The bikes are Trek mountain bikes with lightweight alloy frames, 24- to 27-speed gearing, disc/v-brakes, and Shimano components and front suspension. If you bring your own bike, please make sure it is a mountain bike, preferably with front suspension, in good mechanical order.